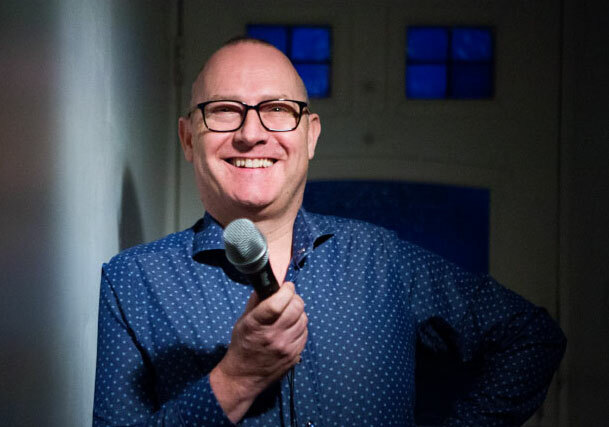 This year, comedian, broadcaster and after-dinner speaker Jeremy Nicholas is returning as Ambition’s MC. His runs his own media training company, Talking Toolbox, and after a Dragon’s Den-style investment he is now co-owner of award winning chocolate maker Bianca Marton Chocolates. We sat down to try and get to know Jeremy… and got more than we bargained for! Peter Kay was once my warm-up man! What’s been your toughest gig ever? In 2007 I was booked as the after-dinner speaker at the black tie gala dinner at the Professional Speakers Association International Convention. I was so nervous as the speakers sat back and waited to be entertained by me, but thankfully it went down a storm and they invited to join. In fact, five years later I became the 41st person in the UK to be made a Fellow of the PSA, and then in 2015, I was awarded the Professional Speaking Award of Excellence. This is a lifetime achievement award presented for the twin criteria of professional attitude and platform excellence. Surprised to win, I promptly burst into tears onstage… showing I had neither. Are there any jobs you’d love to have done? I got down to the last three in the hunt for a new Blue Peter presenter, narrowly losing out to Anthea Turner. Sadly my audition film about recycling polystyrene never saw the light of day. What’s the most unusual thing you’ve ever done for work? I once reported for BBC TV on the face of Elvis Presley appearing in the blue veins of a Stilton cheese. What’s the scariest thing that’s ever happened at work? I was once ambushed by a bearded man in robes who claimed to be Jesus carrying a machine gun. He frogmarched me into a live radio studio, where the on-air presenter was forced to read out a statement demanding the man’s fingerprints be compared with the Shroud of Turin. The man turned out not to be Jesus. What’s the most embarrassing thing that’s ever happened at work? I once split my trousers at the back, moments before walking onstage to deliver a talk on Using Humour. That got me more laughs than normal. Many comedians were educated at Cambridge – does that apply to you too? Yes. I went to Queen Edith’s Primary School. Football’s been a great influence on your work life. Has that crossed over to your personal life? Yes, I got married at West Ham United’s Boleyn Ground on 11th November 2006. It’s an easy date to remember as 11.11 is Remembrance Day, so I know when I start to see poppies, it’s time to book a table at a local restaurant. I was once punched in the face by maverick football manager Brian Clough. I fell backwards and landed on his Labrador.